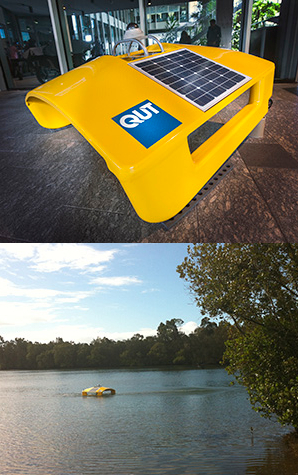 Queensland University of Technology (QUT) roboticist and Inference robotic boat creator Dr Matthew Dunbabin says that if deployed across Australian waterways, the autonomous vessels would vastly speed up the detection and responses to events, some of which have serious environmental or public health implications. “The Inference boats are designed to be our eyes, ears and nose on waterways, 24 hours a day - rain, hail or cyclone,” he said. Equipped with cameras and various air and water sensors, the Inference boats mark the first time that researchers can collect real-time data about the impacts of weather events across waterways, helping authorities better plan for similar events in the future. “As you can imagine, it's far too dangerous for a human to be out in a boat during a cyclone, collecting water samples to measure the amount of topsoil washing into a lake, for instance,” said Dr Dunbabin. “Traditionally, scientists the world over have had to rely on simulated and sparse data to predict, respond to and plan for events like these - data that isn't always dead accurate. Dr Dunbabin said the robotic boat is designed to conduct a wide range of sampling and surveying tasks in inland waterways, including monitoring water quality; measuring gas emissions; inspecting jetties and dam walls; and mapping banks and lake-beds. They can work autonomously or under remote control from anywhere in the world, leading international researchers to enquire about using the boats for ecological research. But they are not the only environmental monitoring robots being developed by QUT - engineers there have also built a ground-based robot that uses sensors to map and count trees and other vegetation. Dr Dunbabin has recently started work on another set of robots that can follow and record wildlife using stealth tactics such as only moving while there are other sounds to mask its own noise. “I wanted to build something that would make Sir David Attenborough proud,” he said. “Studying the natural behaviour of animals in the wild is extremely difficult, particularly if they can smell, see or hear humans. “To get the best footage of them in the wild requires both patience and stealth. QUT researchers are also using unmanned aircraft to count koalas and assess disease in crops and native plants. The projects are part of a research program to create UAs capable of monitoring wildlife, agriculture and air quality to enable better decision making in the management of the environment.